Study refines how climatologists use past to predict future. June 17, 2012. Global warming is understandable only in the context of the past. Without a record of temperatures in the recent past there would be no way to measure change in global temperatures; without historical evidence there would be no way to grasp how humans respond to climatic fluctuations; without an analysis of the (often) distant past there would be no way to develop the models that help predict the possible nature of a warmer climate. The Eemian Warm Period, a 10,000-year epoch that began about 125,000 years ago, is often used to design climatic models. With temperatures several degrees warmer than they are today, much of Greenland's ice sheet had melted, and Earth's sea level had risen substantially. Now, German scholars Henning Bauch, Evgeniya Kandiano and Jan Helmke have published an article in the journal Geophysical Research Letters that reveals a critical difference between the Eemian Warm Period and the hotter climate of the near future. Today the Gulf Stream and the North Atlantic Current funnel warmth towards northern Europe and the Arctic. Because this oceanic and atmospheric conveyor belt of heat has only intensified in recent years, scholars have assumed that the Arctic must have been ice-free during the Eemian Warm Period. Bauch, Kandiano and Helmke examined remains of dead microorganisms (foraminifers) found in sediment cores to confirm the warmth of the Atlantic during the period. Foraminifers from the Arctic, however, recorded far cooler temperatures than expected, suggesting that the warm Atlantic ocean current was much weaker than it is today. 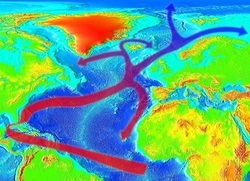 The glaciation that preceded the Eemian Warm Period was comparatively more severe in Northern Europe than it was during the Ice Ages with which we're more familiar, and the German scholars assert that more fresh water poured into Nordic Seas when the ice sheets melted before the Eemian than did at the dawn of the Holocene, our current climatic regime. "This situation had three consequences," explains Bauch. "The oceanic circulation in the north was reduced, and winter sea ice was more likely to form because of lower salinity. At the same time, this situation led to a kind of 'overheating' in the North Atlantic due to a continuing transfer of ocean heat from the south." By refining our understanding of the Eemian Warm Period in the relatively distant past the German study, which has received media attention elsewhere, will help improve climatic models of the future.